This is an blog entry from our Austrian friend Isabel, who stayed with us last month. She can’t wait to come back to the Highlands and make Kilchoan her base. “Last Wednesday, the weather was completely amazing (Indian summer – about 20 degrees and sunshine all over!). We went on a little road trip, along the scenic shores of the West coast of Scotland, starting at Kilchoan and heading for Mallaig. Our first stop was at the Coffee and Tea Shop in Salen, for a lovely cup of cappuccino and for taking some photos from the jetty over the sparkling loch. There were many beautiful places and photo opportunities on our way to Mallaig; white sandy beaches, cliffs, the sea, hardly any people around – what a wonderful way to explore the scenic landscape and get to know this picturesque area of Scotland better. Mallaig is a lovely town surrounding a harbour, busy with Ferries and fishing boats. It has many nice places to eat, shop, with lots of fresh fish of all types on the menus. My friend dropped me off at Glenfinnan station, where my train to Fort William was due in three hours, so I had quite a lot of time to explore the beautiful scenery around Glenfinnan. At first I decided to take a look at the museum, which is on the platform, where I learned a lot more about the Viaduct building process and about the railway itself. Afterwards it took me about 20 minutes of slow walking on the woodland trail to get to the Viaduct itself. Hardly anybody was there as I made my way up to the viaduct, which is also very well known for the appearance in the Harry Potter movies. When I got there some of the people had kind of the same idea I had and were waiting for the Jacobite Steam Train to arrive. So I sat there relaxed waiting for the train, and got some pictures, phoning back home to share my day. 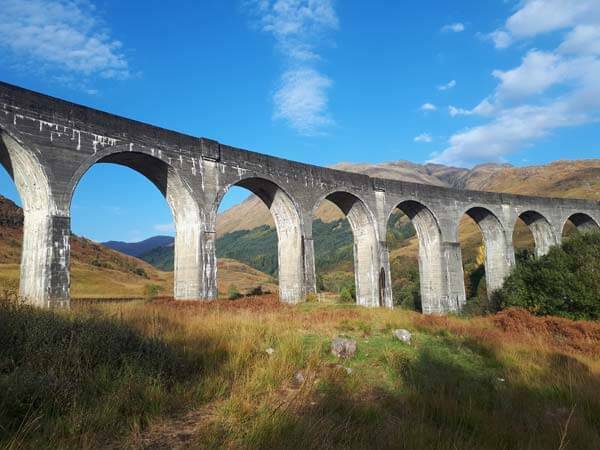 Then I could truly understand why they picked this viaduct to be shown on the Harry Potter movies, it was magical. A little bit later, after I went to the station again, I caught the train to Fort William to meet my friend Wendy, we grabbed some sandwiches at the supermarket and went for a walk near Ben Navis. It was beautiful how the sun set over Ben Navis. We finished our walk in the dark. When we were driving back home to Kilchoan we got to see a lot of deer, we also got out of the car, in safe places of course, and hat a wee bit of a eye contact, till the deer seem to vanish in the dark woods, what a truly magical experience, the stars were out too, it was such a lovely day and night.